As the National Association of Hispanic Publications continues to develop programs, it looks to the various industries that may be falling behind in servicing and informing the Hispanic community. While researching these industries to create initiatives that target and benefit our members constituency/readers the NAHP found that the automobile industry is not reaching out to this community proportionally based on population or purchasing power. 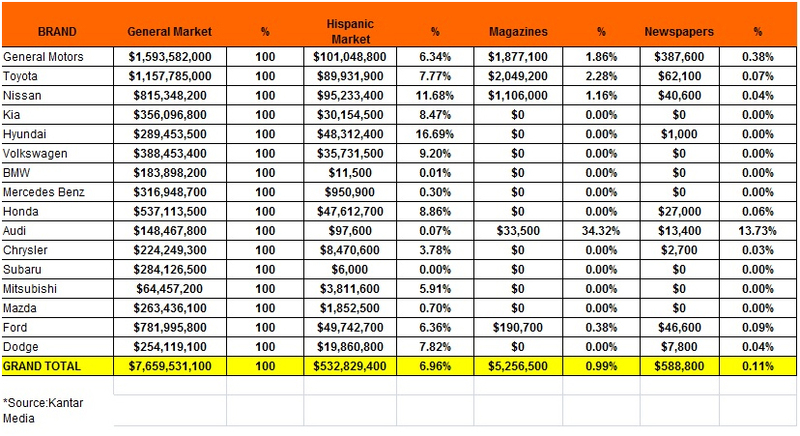 Nissan is the company that proportionally invests more money in publicity geared to Hispanics spending $95,233,400, while Subaru spends the least on publicity to the Hispanic market allocating only $6,000. Based on these numbers, we can come to the conclusion that the U.S. auto industry has not focused on the needs of this segment of the market, which according to the U.S. Census is about 54 million people, or 17% of the population, with a purchasing power well above $1.3Billion. The time is just right to take the necessary measures to invest in publicity/marketing geared to this growing population in the U.S. market which has not been properly addressed. The NAHP is working with the Auto Industry to change this disparity and change the way the industry markets to our community and include our members in the vehicles used by these corporations to reach out to the Hispanic community through a medium they understand and feel connected to: Hispanic publications and newspapers.